It is a very common belief that the Chinese economy is doomed to forever trail America. They are the nation that produces much of the junk we buy at places like Wal-Mart. If the U.S. should stumble, China would have no place to sell all its goods. This old economic formula is rapidly becoming outmoded. China 's trade with the rest of the world has exploded in the last few decades. Its largest trading partner is now the EU. The U.S. only amounts to 23 percent of its export market. China has seen stunning growth in its economy. Since 1992, GDP in the red giant has grown 9.1 times, going from 2 trillion yuan to 18.2 trillion yuan. While the rest of the world is trying to recover from recession, China is trying to slow its economy down. 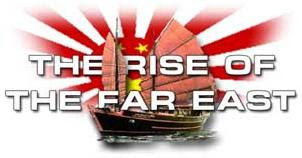 It overtook Germany in 2007 as the third-largest economy and is expected to unseat Japan as No. 2 behind the United States as early as this year. Its trade boom has helped Beijing pile up the world's biggest foreign currency reserves at more than $2 trillion. China edged past Germany in 2009 to become the top exporter. Total 2009 exports were more than $1.2 trillion. That was ahead of the $1.17 trillion forecast for Germany by its foreign trade organization. China is now the world’s largest auto market after its vehicle sales jumped 46 percent, ending more than a century of American dominance that started with the Model T Ford. It was a nightmare year for Detroit. U.S. auto sales were down 21 percent, and GM and Chrysler both declared bankruptcy. Chinese banks now rank in the top four slots as the highest-valued banks in the world. China Merchants Bank, China Citic, ICBC, and China Construction Bank lead the list. Thanks to the financial meltdown, the U.S. only has two banks in the top ten. "Saying to the sixth angel which had the trumpet, Loose the four angels which are bound in the great river Euphrates. And the four angels were loosed, which were prepared for an hour, and a day, and a month, and a year, for to slay the third part of men. And the number of the army of the horsemen were two hundred thousand thousand (200 million): and I heard the number of them" (Revelation 9:14-16). When John wrote this prophecy in the first century AD, there weren't even 200 million people on planet earth. For centuries, it was a mystery to some people how the Bible could be talking about an army of 200 million soldiers. The human population exploded in the twentieth century. When China 's population neared the one billion mark, end-time writers realized that John's vision was true. In the early '80s, I remember being fascinated by Hal Lindsey's Late Great book that mentioned how it was now possible for China to field an army of this size. There was still one problem with China being the kings of the East. China may have had the manpower, but it lacked the ability to outfit such a large military force. It takes a nation of economic might to organize a large army. For centuries, China was so feeble that it was unable to fend off a host of colonial powers. The solution came with the Chinese economic miracle. It is the only communist nation on earth that has been able to prosper. Where once stood mud huts, one can now find modern cities that have so many skyscrapers they put cities like New York and Chicago to shame. All China needs now is for the four demonic angels to come set them marching westward. "And the sixth angel poured out his vial upon the great river Euphrates; and the water thereof was dried up, that the way of the kings of the east might be prepared" (Revelation16:12).